Napa Valley has their very own witch, but he’s not dressing up as one for Halloween. He’s a water witch and it’s something that he celebrates every day. A water witch is someone who uses a rudimentary tool like brass rods or a Y-shaped twig to help them detect natural energies for whatever they may be searching for, and in this water witch’s case, water. Water witching goes by many other names, though “dowsing” and “divining” are most common. 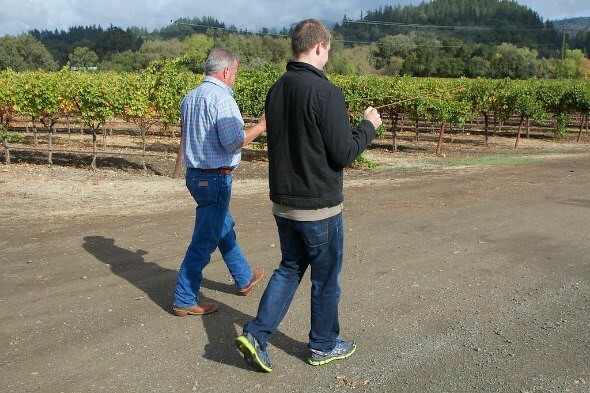 Marc Mondavi, third generation winemaker, has been dowsing for water since he was a teenager. He was turned on to the practice by the father of his girlfriend at the time and his interest grew from there. Having the energy to be able to dowse isn’t uncommon, Marc says, but very few have enough of it to be successful at it as he has been. His talents have recently gained national attention as California faced record droughts and his skills were sought after by vineyard owners and other farmers who needed new wells for access to water for irrigation. He’ll walk the property holding an L-shaped brass rod in each hand parallel to the ground after “telling them” to find water. When the rods cross, he’s found water, or one edge of an underground stream or spring, at least. He’ll then continue to walk until he finds the other side. Next he’ll determine how deep the water is located and the volume of the flow. He accomplishes this by once again asking the rods a series of questions, like “how deep is the water,” followed by him listing off depths in 100 foot increments. When he says the right depth, the rods, once again, cross. Needless to say, he’s been successful. The people he dowses for spend a decent amount of money getting a professional drilling team in to drill pilot holes at the spots plotted by Marc. This isn’t cheap, costing tens of thousands to hundreds of thousands of dollars, and if he was consistently wrong, he wouldn’t last very long in this activity that he does extracurricular to winemaking. But he’s been very good at what he does, and after speaking with the drilling team or farmer after the drill, he has found himself to be within several feet of the depth he suggested water would be found and within 20 gallons of water per minute of the flow he predicted. I recently visited their St. Helena winery to get a little hands on action myself. It feels a little weird and looks a little weird but it’s interesting nonetheless. After learning the basics, I gave it a try for myself. With rods parallel to the ground, I began to walk but after around 20 feet nothing had happened. I turned around to see Marc with his rods crossed looking down. I had failed my first try at dowsing, but also recognized that I wasn’t concentrating hard enough. Determined, we started over and tried it again. I cleared my head, ask the rods to find water, and began to walk. Loosely, but surely, holding the rods, I let them do their thing and sure enough they crossed right where Marc had previously indicated water. Was this the power of suggestion or some outside factor? I’ll never know, but Marc did tell me that he felt I carried the energy to some degree. His dowsing is also the theme of his newest wine brand The Divining Rod. 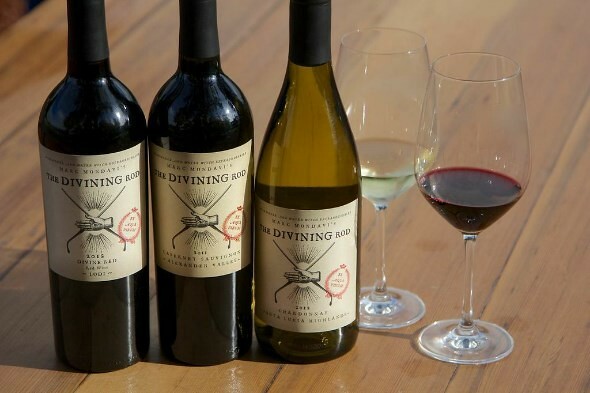 The Divining Rod currently features three different California wines; a Cabernet Sauvignon from Alexander Valley, a Chardonnay from Santa Lucia Highlands, and a red blend from Lodi, with all three having been received well and the Cabernet earning an “Editor’s Choice” from Wine Enthusiast.